I’m not sure how you guys spent your festive break but mine was chock full of hanging at home with my peeps, jigsawing like a boss and watching all the Harry Potter movies back to back. Pretty much the best time ever. But after a few days my sewing hands got twitchy and it was time to knock up a festive gift for a friend. But what pattern do you chose when you are 1300kms apart and can’t do fittings, have diametrically opposed clothing styles and want to make something a bit fancy? Three words people: super. rad. kimono. Disclaimer: yes, this is the kimono I made for my friend and she is cool with me sharing it before it gets posted because I am a big show pony like that. Neigh! The fabric is a super drapey and slippery rayon from Joy’s Fabric Warehouse and unfortunately it is all sold out now. Boo! 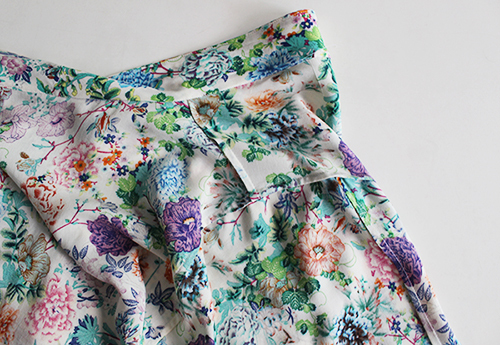 The floral pattern is perfect for a kimono and it feels absolutely luxurious on your skin. Real talk – this was my first time sewing with rayon and there were lots of rookie mistakes made. We’re talking cutting on the fold not on the flat so sides were seriously uneven, draping bias cut pieces over the back of the couch overnight so one sleeve head went all mutant shaped and not putting in a fresh needle to start resulting in the machine eating my first seam attempt. Ugh! Just because you have been sewing for a couple of years does not mean you don’t make epic fails anymore… On the plus side, as it was holidays I could go sulk and rewatch Jessica Jones with a gin! So let’s talk construction. 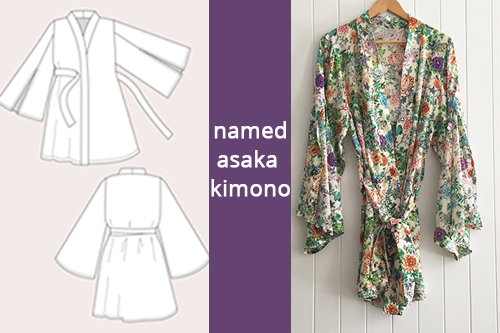 Whilst the Asaka is rated Intermediate I believe a confident beginner (armed with cotton rather than silk/rayon/slippery fabrics of cheekiness) could whip this up and have a tops garment. One thing to note is the pattern doesn’t specify French seams as the standard, which is odd given that the recommended fabrics are all slippery suckers. The seam allowances for Named are 3/8” and made for the smallest French seams I have ever done. I ended up using my walking foot to help feed the fabric evenly, took it slowly and it was so worth it in the end. The insides look absolutely smashing! The instructions were easy to follow which hypothetically lends itself to straightforward construction. Unless you cut fabric on the fold and let it stretch out and then have to ease extra sleeve head in even after you try and trim it down but then you sew that irksome sleeve inside out because you are tired and grumpy and now the misshapen sleeve head is fraying from your unpicking efforts. UGH! Needless to say we got there in the end with our good friend the seam ripper. The moral of this story, folks? Spend Boxing Day rubbing your belly after eating your Christmas feast and jigsaw-ing like it is hot and don’t try to sew up slippery fabriced numbers! The sleeves. They make me want to swoon with their fabulousness! The lack of fitting required. When you are gifting for someone 1300kms away it is tops to have something that you don’t have to toile. Pretty much the whole dang thing, really. Maybe it is all the festive champagne talking but this whole pattern rocks out hard. How about we start with the obvious one and make one for myself? Because from where I am sitting that would be a seriously boss move! Lengthen the belt. I know this is four sizes down from what I would wear but I want a super long belt! 1. Fit wise, I need more room in the waist to have some wrap around happening (had to turf a bunch of photos due to gaping at the waist) and the sleeves begin about an inch in from shoulder bone so not the most comfy fit. Got it! 1). Coverage. 2). Twirling. Love the kimono! Love your blog posts! Everyone needs a twirling kimono!! Such a beautiful kimono. The fabric is amazing and the sleeves are awesome! Thanks, Caroline! The fabric feels so lovely. Am just boxing it up now to send away. Noooo! I love the Kimono and am looking at it for myself. I do have one comment regarding the “print” on your blog. Is it you or the program you are using (I’ve read a few other blogs that are the same) that renders the print in a medium shade of grey? True, I am older, and my eyes are older also, but reading blogs in lighter print is very difficult and even hurts. This may be beyond your control and I do not mean to offend in any way as I enjoy your blog. It is just something I’ve been noticing lately. And thank you for feedback regarding the text colour – it’s always good to know what is/isn’t working 🙂 The font colour is what comes with this theme – I’ll look into whether it is possible to make it darker. Eye strain is the worst – ugh! Gorgeous! 🙂 I have this on my plans to make this month, just trying to decide what fabric. Also trying to decide if I make it with the amazing and fabulous sleeves, or let practicality get a look-in instead… Hmmm…. And boo hiss to Kylo but yay to his amazing outfit. The sleeves totally made me think of all the layers in his coat. It is so awesome I kinda want to cosplay it! My goodness. I am in a total state of lust. I want this bad!!! I even have the perfect 3m of rayon from Darn Cheap to make it with. Wonder if I can justify a new pattern??? Seriously gorgeous! Yes, yes you can! It is such an amazing pattern! I’m already scheming for my one… Perhaps it can be my sewing sesh attire? Oh yes, you gotta add one to your own collection! I think we all need rad kimonos!!! This is absolutely gorgeous! I’ve been lusting after this pattern for some time, but can’t really justify it for my totally non-posh lifestyle. (Although, come to think of it, the delivery man caught me in my gross old terrycloth bathrobe just this week, so maybe I should upgrade!) But, one of my dearest friends is getting married at the end of the month, and this seems like the perfect gift for her to take along on her Caribbean honeymoon! Thanks for the inspiration! Ohh, it would be a perfect gift for her! It would be lovely to get your makeup done in too on your wedding day. Multi-purpose gift! Canadas, ayy? What is 3m in yards? The prices at Joy fabrics, is that dollars? In reagrds to bthe kimono — AWESOME SAUCE!!! Love the print, OMG. I would love to add this to my list of projects for 2016. I may have to give real consideration but how difficult would it be? Is there a translation factor? French seams. Do you have to add fabric to compensate for the folds? I tried to do and the make felt tight. I think it’s about 3.3 yards of fabric and Joy’s prices are in AUD. I think a confident beginner could do this if they use a cotton and did not French seam. No translation issues for me – this pattern is in English. Have fun making it up! So much awesomeness! 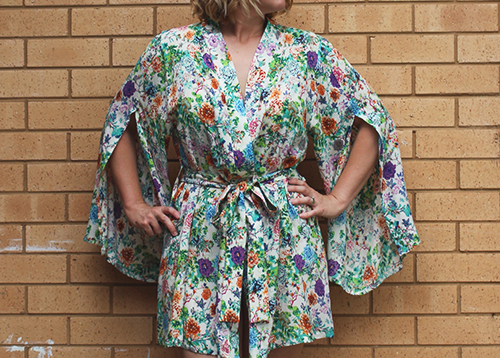 Love the kimono and now really want to make one for me as a fancy summer dressing gown! Suzy, you need to do eeeeeet!!! You can be a lady of luxury! I can’t count how many times I’ve bought fabric or patterns to make something for someone else, only to make it for myself… you’re a saint to give this pretty up! And I’ve so been there cutting rayon on the fold. It is my one generous act of the year, Morgan. From then on I will be Gollum-ing everything I make. And so glad to hear someone else got suckered in by the rayon. I felt like such a dolt! Do it!!!! All rad ladies need kimonos! And how great is Jessica Jones? I watched the whole thing in like, two days! In reply to Vicki: Google is your friend. Type in “AUD to USD” and Google will translate. (Assuming you’re American. ) So goes meters to yards: “3 meters to yards”. Google says 3.28084. So 3 1/3 yards should do it. And Amanda, You obviously now have a world of friends, not just 50! OBVIOUSLY every woman on Earth needs a kimono or two. If IS read this, women could shed their birkas and you could create world peace! Sometimes I crack me up! But really, why not? Love the fabric pattern, it’s so pretty, and in a rayon must feel so slithery and comfortable. Looks like a great pattern. Um, am I crazy? I want to see this out on the town with leggings!!! Awesome kimono. Your friend is a lucky gal. I just found your blog and now I want to make ALL THE THINGS. I have finally gotten brave enough to start sewing my own garments, and here you are with a similar style and size so I can see how things may look. Plus, I love how your photos aren’t all “bloggy” and boring! YAY! So, thanks for sharing!